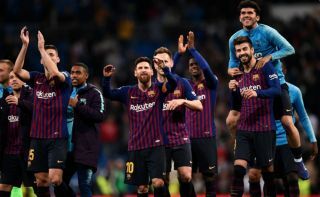 After their 5-1 win over Lyon on Wednesday night, Barcelona set a new Champions League record as they continue to dominate European games at home. The Catalan giants will be considered one of the favourites out of those remaining in the competition this year as we reach the quarter-final stage. Ernesto Valverde’s men were held to a goalless draw in the first leg against Lyon, but ultimately they had too much quality for their French rivals in the return meeting as they ran out comfortable winners on the night. As noted in the tweet below from BT Sport, they also managed to create some Champions League history too, as they set a new record for the longest unbeaten home run in the competition, which now stretches to 30 games. That is an ominous warning to their future opponents, in that they may well have to secure a significant advantage in their home leg if they are to get the best of the reigning La Liga champions as clearly it’s a huge ask going to the Nou Camp and picking up a win. Tottenham, Inter and PSV all failed in the group stage this season, and now Lyon are the latest to fall short and suffer defeat at the home of Barcelona, which is undoubtedly becoming quite the fortress. With the draw for the quarter-finals set on Friday morning, it remains to be seen who will be next to try and end that impressive run, with the likes of Juventus, Man Utd, Man City and Liverpool all still in contention.